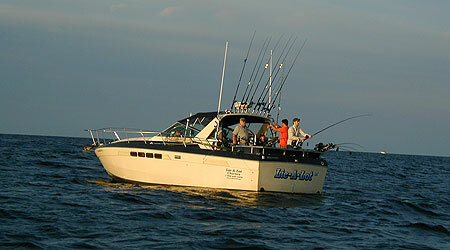 Welcome to Lie-A-Lot Charter Boat Fishing of Ludington! Ludington is the number one port for Salmon and Trout fishing on Lake Michigan. According to the DNR fishing reports, more fish are caught in Ludington per angler hour than anywhere else in the state. Charter boat fishing is big business in Ludington. Captain Mike operates a full time, full service charter boat operation. Our goal is to provide everyone with a quality fishing experience that you will remember for a life time. Whether you’re a first time fisherperson or an experienced angler the Captain will customize your fishing trip around your needs. Your Ludington Charter Boat Fishing Vacation! There's something for everyone when go charter boat fishing with Captain Mike. The excursion will be the highlight of your vacation. It’s all about having a fun fish catching trip that's an adventure for all. When you're not reeling in the fish you'll notice that the scenery from the open waters of Lake Michigan is truly spectacular! Sand dunes line the shore from Little Sable Point, by Silver Lake Sand Dunes, to Pentwater, to Big Sable Point at Ludington State Park and on past Manistee. The area is accurately named Ludington’s "GOLD COAST" and truly a sight to see from the waters of Lake Michigan. While we are out to sea, we may encounter many vessels. They range from the world famous carferry - S.S. Badger - to big freighters, tugboats, tall three masted schooners, and even mega yachts. There may even be an old pirate ship in the mix!